Boat Description Targa 17 Sport. This compact, flexible package does it all. 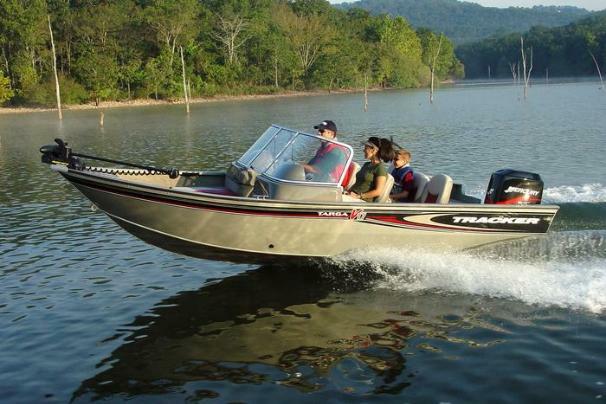 Its aft swim platform and boarding ladder, AM/FM/CD, convertible bow deck with padded cushions and three-across aft seating are great family features in a Deep V boat that`s also designed for serious fishing. Storage everywhereunder-seat, in-floor, under-deck and along both sides. The passenger console even features a tackle tray and storage. The package includes Mercury Pro Series outboard and fishing features like tilt steering, Lowrance X37 fish finder, Minn Kota foot-controlled trolling motor, 19-gallon bow livewell with baitwell, 23-gallon aft livewell with baitwell insert plus custom trailer with EZ lube hubs, GalvaShield protection and swing-away tongue. Dry Weight 1275 lb approx.